Peaceland College of Education Enugu, Nigeria in Affiliation with Chukwuemeka Odumegwu Ojukwu University, COOU also known as Anambra State University Postgraduate School Admission Form for 2018/2019 Academic Session on Sale. 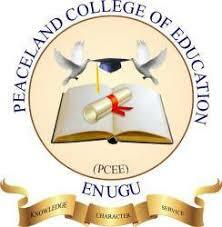 Peaceland College of Education Enugu, an Affiliate of Anambra State University is positioned to produce quality and qualified teachers who will operate the Nigeria educational system effectively and efficiently to remedy the observable anomalies in Teaching Profession. Masters in Education (M.Ed.) and Ph.D. Recommended: Peaceland College Diploma and Certificate Admission Form 2018/2019. Duration of the Programme is one academic session of two semesters. All in a View to install advance pedagogical methodologies and techniques to our students, as well as some important skills that is necessary for graduates to offer effective education to the future generation. The overall philosophy of our Post Graduate School is the Development of Professional educators who will be social engineers of change through education either as professional Teachers, Researchers or managers of educational institutions. The college achieves this philosophy with the help of their qualified and learned staff who do not just teach but also engages the students in group exercises, extensive educational research and individualized instruction. Hence we are positioned to run post graduate academic programs that will cater adequately for State, National and international educational needs. • Time management. At Peaceland college of Education our PDE and PGDE programs run for the period of twelve (12) months consecutively while our masters program is for a period of eighteen (18) months only. • At the end of all our programs, the graduates collect their certificates without delay. You can call the PG School on 07067358149 or visit 10old Path Close Independence Layout by MSP Junction, Mkpokiti-Junction, Enugu.